Engaging a crowd about my work during an artist talk at the Museum of Fine Arts. Me and one of my favorite artworks with the post artist talk glow at the Museum of Fine Arts. 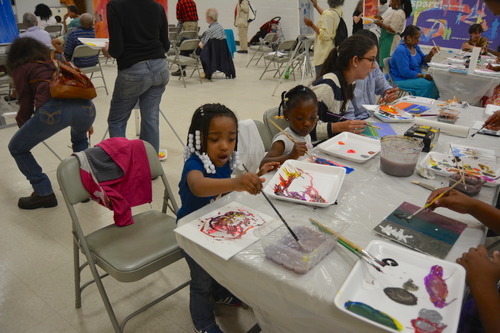 Here’s a peak at busy art makers at a public program I developed for the Museum of Fine Arts. Caught a lovely family wearing their creations made during a public program I developed for the Museum of Fine Arts. Crowns and cool kids with me at the Museum of Fine Arts. Presentation ready at the Black Portraitures Conference at Harvard University. 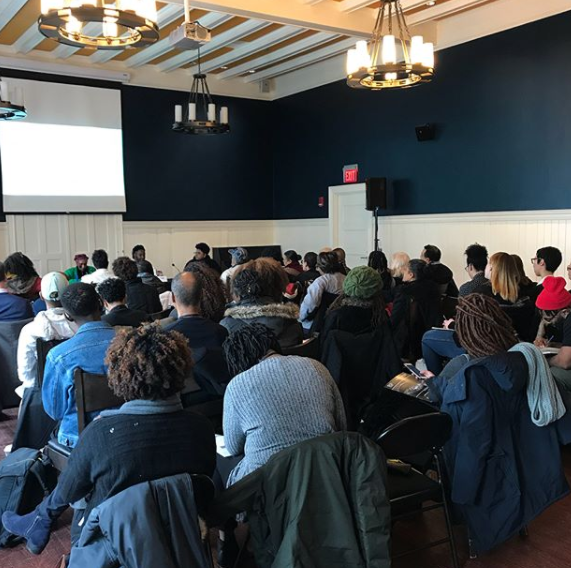 We had our session filled to capacity at the Black Portraitures Conference at Harvard University. Spending some time discussing Alison Saar's "50 Proof" sculpture with 4th graders for the Bakalar & Paine Gallery's Looking to Learn Program. Talking with a student about the contours of Saar's "Hankerin' Heart" so she can pull some inspiration for her own sculpture made of wire. Here I speak with a student about why she chose Saar's "En Pointe" piece as a starting point for her sculpture. 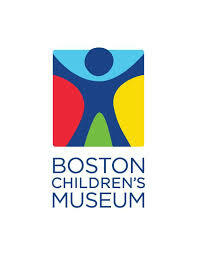 Helping out a little one during an art workshop I developed for The Children’s Museum in Boston. Here a student and I point out parts of the sculpture that seem most ambiguous for the group to reflect on within The Birthday Party exhibition at the ICA in Boston. A proud high schooler shows her peers and I a sketch she created inspired by what we have seen in the gallery. Here's a close up of her sketch that displays her invention to make the world a better place using objects found in the gallery. Here I am pointing out some techniques used in the altered book that was apart of the exhibition. The art making has just begun in the classroom as this student tells me her plans for a collage inspired by Susan Weil's text piece. This student was really excited to share his love for patterns and how he was going to add that to his work. Here is an example of one of the student collages. This student and I are thinking through some techniques for making the boarders of his collage pop. Another student collage from our 45 minute art workshop. Jacob Lawerence's dynamic compositions are captivating us all in the gallery. Here I am giving some info to my students on how to select parts of the still life for enlargement during the Saturday Studios High School Painting Course. One of my students painting in progress. Here's a view of sparc! 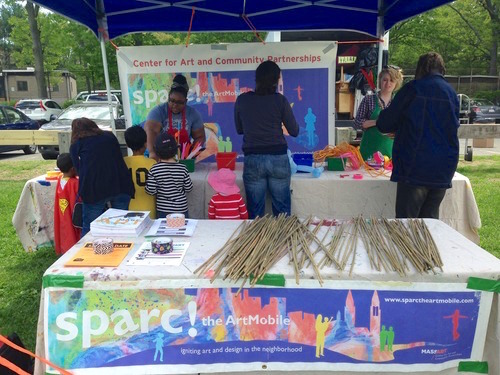 the ArtMobile's magic wand making table at the Kite n Bike Fest. Here I am helping out to two very excited magic wand makers. Here I am posing mid paint prep with fellow sparc! team member Cory Ploessl and Director Ekua Holmes at the Paint Jazz Event in Bromley Heath. Painting in action from some of the participants present at Bromley Heath for Paint Jazz. My students and I basking in the afterglow of inspiration during our trip to MassArt's Library to view the private collection of artist books. 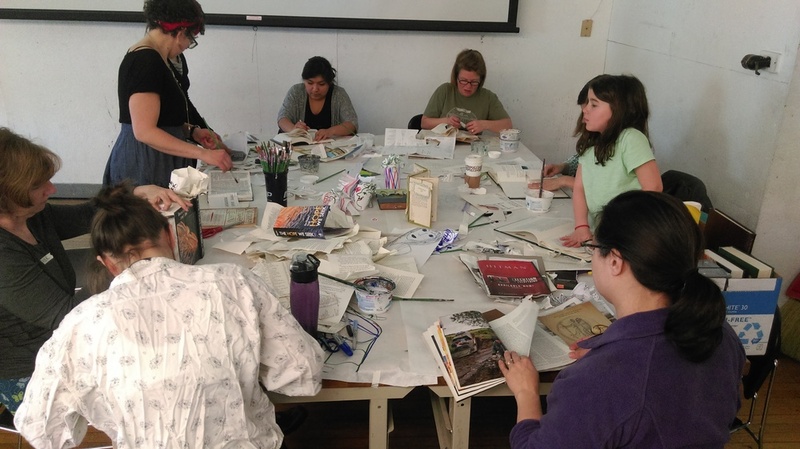 My students are hard at work making their own artist books. 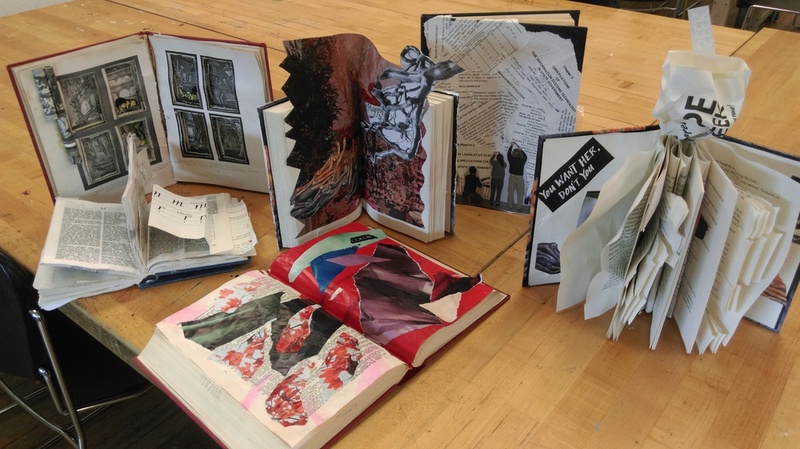 Here are some of their artist books in progress. 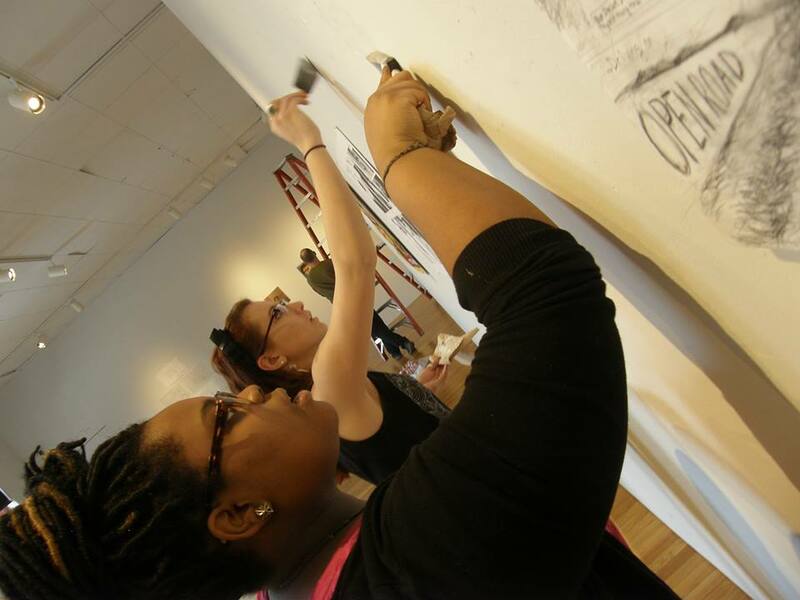 My freshman mentee and I prepping the gallery walls for the Fusion: Academic Compass Exhibit in the Brandt Gallery. Here's the full range of emotions felt after curating and installing an art exhibition via my two freshman mentees and colleague Christopher Sullivan. I firmly believe in helping people discover meaning, purpose, and relevance in art and the process of making by highlighting their intrinsic connections to any aspect of life. When it comes to teaching, I like to keep the phrase “Everything But the Kitchen Sink” at the forefront. This simply means that other disciplines, pop culture, and current events are open to appropriation as a compliment to the themes and techniques we will explore in art. Rather than viewing the Arts as an ancient island of isolation for a select few, I want to help people feel comfortable using the lenses of personal, social, and historical experiences to build connections between what they think, see, and make. I also have a particular specialty in making contemporary art digestible for those who find it weird and uncomfortable to engage with. As an extension of this philosophy I have shared the power of art in a variety of settings. Thus far, I have cultivated programming at summer camps, public schools, college campuses, museums, galleries, and non-profit settings like libraries and community centers. I have also been featured as a speaker for numerous conferences and panels around issues of social justice in regards to art, education, and museums.